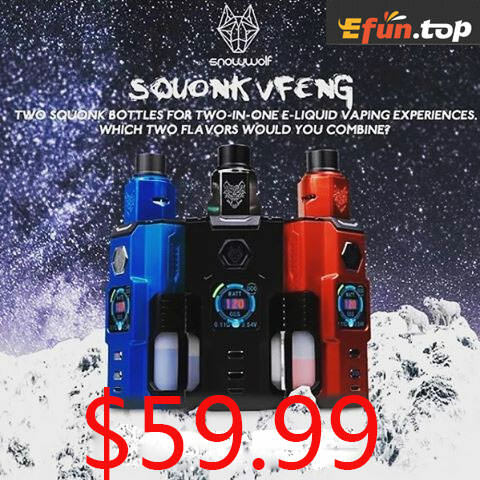 The First Double Squonk Bottle Skuopker,Sigelei Snowwolf Vfeng ,Surprised You? here comes the first squonk bf kit by Snowwolf-sigelei SnowWolf Vfeng BF Kit , It consists of Snowwolf Squonk Vfeng BF mod and Snowwolf RDA tank. Vfeng Squonk BF Kit features the total 6ml capacity dual squonk bottle and the 1.30'' TFT colorful screen. Compatible with the single 21700, 20700 and 18650, its wattage can reach up to 120W. It is easy to build as low as 0.05ohm in the TC Mode and 0.1ohm in the wattage mode. SnowWolf Vfeng Squonk Kit brings the powerful and technological sense. it Will give you an unexpected experience ! only 59.99$ you can take it away!